We went to Hawks Nest for four fabulous days of sunshine, swimming, resting and eating over the Australia Day long weekend. It was such a nice way to end the school holidays, we all became very relaxed and lazy. The weather was just superb. There always seems to be a little theme to each of our breaks at Hawks Nest. Sometimes we ride the bikes a lot, sometimes its Bennetts Beach we visit and collect masses of sea shells. The theme to this little break was..... snorkelling! 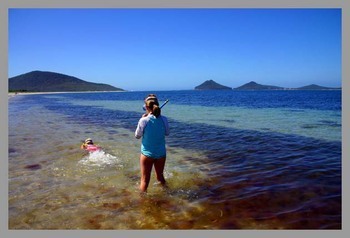 The girls were keen to try snorkelling, and the conditions at Jimmys Beach were perfect this time. We went to the local fishing/sports store and purchased the masks and snorkels. Right at the end of the shopping trip the girls asked if we (Paul and I) were going to snorkel with them. Why not, I thought, so I bought the gear as well, it'll be fun! A couple of pictures to follow. 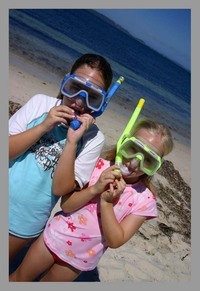 To the right is a picture of the girls in their new snorkelling gear. Sorry, no photos of me! Below is one of my favourite photos from the weekend. I love taking photos with those dramatic mountains as the backdrop. The first Scrapbooking Memories for 2006 is around. It is full of bright and wonderful layouts. It marks a few changes in the Scrapbooking Memories Creative Team, with the addition of Rachel Greig and Kirsten Butts. Big welcome girls! Also, from this edition only one Scrappin' Step by Step will be featured in each edition, with me and Leah writing alternate articles. I started with this edition with a Wearable Scrapbooks Step by Step. And Chris, you have a new best friend... my mum. 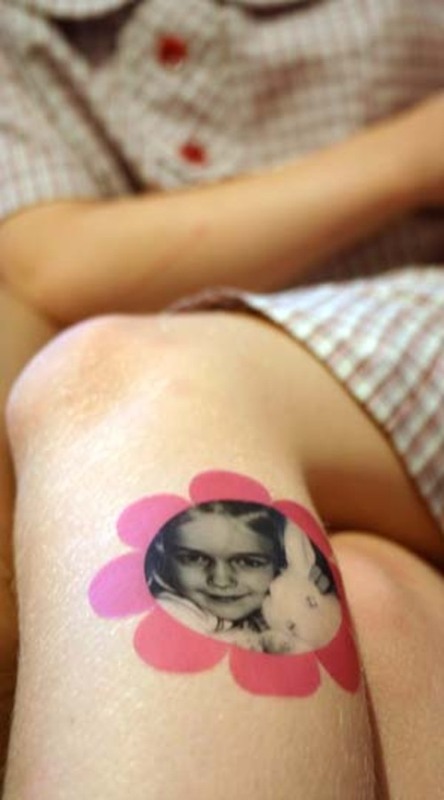 She was so excited on the phone today saying, "have you seen the layout that Chris did on you? Isn't it a lovely layout, and she had such nice things to say about you." In the next few posts are some pictures of my wearable scrapbooks... I had a lot of fun making these. This is the Step by Step project in the latest Scrapbooking Memories. Instructions are in the magazine. 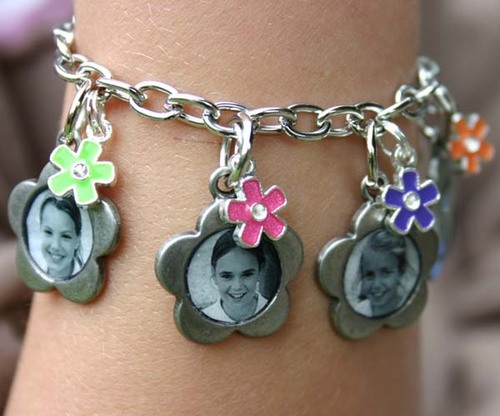 I've used Li'l Davis flower charms attached to a bracelet. OK, so we love our bunnies. Emily was so excited when I made this. 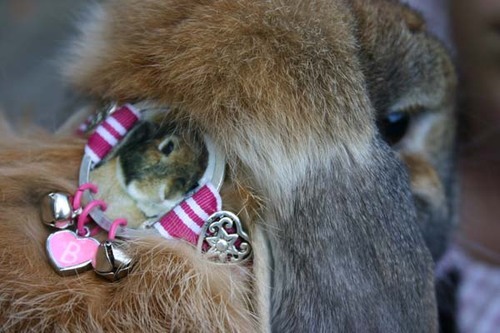 Butterscotch gets dressed up in her new collar and 'jingles' her way around the back garden. 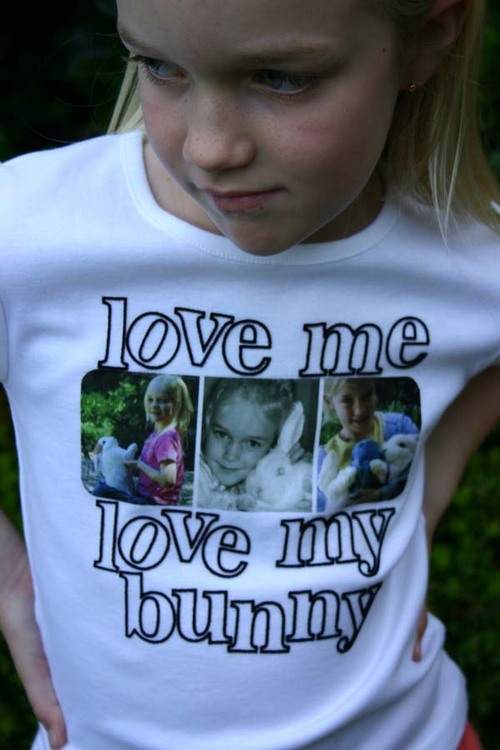 The next project in Scrapbooking Memories... well, what can I say.... yes, Phoebe does wear this t-shirt, she proudly wore it to mufty day at school last year. She loves her bunny so much, it really is a case of lovin' the bunny to earn her affection! Celcast iron on transfer paper was used to apply the photos to the T-shirt, then the gorgeous Heidi Swapp iron letters to finish. These were a lot of fun, and the possibilities and uses are endless. Made with Celcast Tattoo Paper. 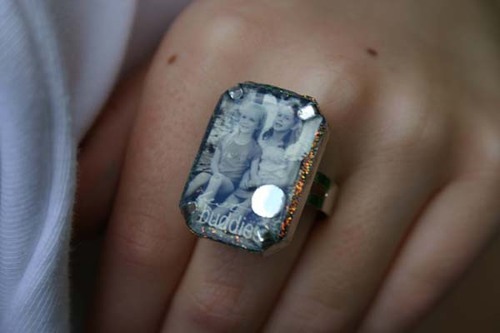 Last one... the best buddies ring. A fun little treat for kid's party bags. The little silver circle in the bottom right corner is a little rhinstone jewel, which was glued to the photo before the ring was covered with the Diamond Glaze. That's all the little details from the Wearable Scrapbooks for now. Just adding this layout to my photo album. It was featured in my screen printing Step by Step in Scrapbooking Memories magazine recently. It uses mostly Heidi Swapp products - except for the brads! The HS mask (large flower pattern) was used as the template. I screened the pattern with white acrylic paint onto a large piece of wet media transparency. The transparency was then trimmed to the same size as the background cardstock. It is secured to the cardstock using the HS tape, which is wrapped to the back of the layout. Also, the brads used to hold the acrylic letters also help hold the transparency in place. 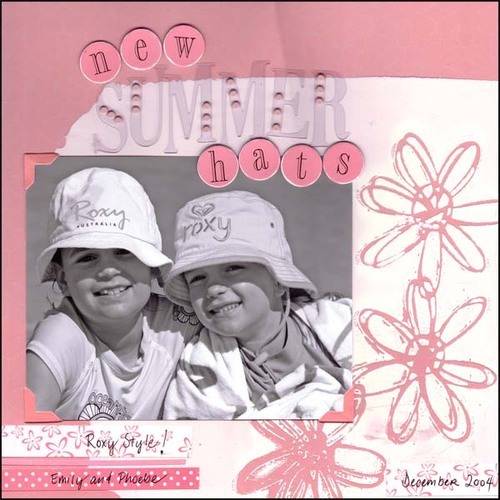 The layout shows my gorgeous girls from last summer, sporting their new summer hats! Happy New Year everyone! Thank you to those of you who have sent greetings during this time. We have had a very relaxing and lazy time in the Carter household over Christmas and new year. We spent several days at Hawks Nest over Christmas, then back home to Sydney for some more laziness. 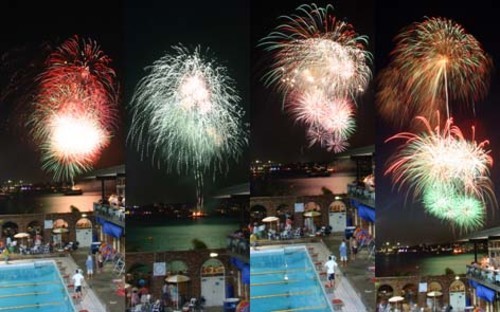 New Year's eve was spent at North Sydney Pool. Lots of swimming, chatting, eating and watching of fireworks on Sydney Harbour on a beautiful balmy night. Full of enthusiasm from my recent photography course, I very ambitiously attempted to take some photos of the fireworks, which I share below. I am quite pleased with them, they are, after all, taken on full MANUAL mode!!! Back to enjoying summer in Sydney.